VW-skandalen för att finansiera terrorism. Global Scientific Authority can, without any doupt, define that Mr Winterkorn and the other VW-staff, did not fool the whole world without full sanctions among the main three owners, Porsche-Piëch-families, Qatar-holding representative and the Bundesland Niedersachsen representative. Total impossible especially among German leadership traditions. There are three main solutions possible. A: Winterkorn keep on lying, VW-group and all shareholders will have to pay compensations and ruin the VW-group. B: The three mainowners are designated and will have to pay the compensations. C: As B but the Niedersachsen representation declared as not democratic representative and it´s Bundesland population without guilt. The C-solution should be seen as the most appropriate as the Bundesland representatives obvious have not fulfilled their democratic mandate and enjoyed the other two main owners short term interests. Qatar has been engaged in conflicts in the Middle-East and was in a need of short term high revenue. A high revenue to finance terrorism and non-democratic interests in the Middle-East. The need of quick money for political ambitions in the Middle-East did also give the mandate to fix with the emissiontests and fool the whole world. Such a mandate did not the Bundesland representatives have. Mr Winterkorn has to choose between to enjoy terrorism or to enjoy democracy. Global Scientific Authority will not let Qatar Holding and the Porsche-Piëch families slip out from their responsibility for Dieselgate. We all understand that the try to fool the whole world was full sanctioned among the main owners. Did VW-staff from 2009 to 2015 try to fool both the world and their own main owners without no win but just a big risk. There are no motives and just big risks for everybody involved excluded the the main owners. They have had big revenues and also have market the brand as in an environmental lead. Not just a fake to fool controls, also a fake used for marketing the VW-brand as an technical leading environmental brand. "On 18 September 2015, The US EPA announced that Volkswagen had installed a "defeat device" software code in the diesel models sold in the US from 2009-15. The code was intended to detect when an emissions test was being conducted, and altered emissions controls for better compliance. Off the test stand, the controls were relaxed, and emissions jumped 35 to 40 times regulatory levels." "On 22 September 2015, VW AG admitted that 11 million cars worldwide had been fitted with software intended to deceive emissions testing." The motives and revenues are so tied to the main owner, exluding all others, that there is no need for an acknowledgement. US-investors have now sued VW-group. The main question is if EU and the Germans, in conflict with their populations interests, will try to keep on hindering justice. Germany and EU has failed to let VW compensate nations, retailers and customers for dieselgate. As below German transportminister,Mr Scheuer, also do active act to hinder compensation. Everyone familiar to German traditions understands that the main owners, the Porsche-Piëch family and Qatar Holding, fully has sanctioned to fool a whole world. Owners with huge political burdons that for several years have had an illegal revenue based on an advanced techniqual solution invented only in the purpose to systematic fool expertice and customers. The total market stockvalue for Porsche-Piëch is about (155 miljon shares) x 150 Euro = 23 250 miljon Euro. Qatar Holding owns about (73 miljon shares) x 150 = 10 950 miljon Euro. Porsche-Piëch and Qatar Holding are establishment representatives protected and backed up by German government and EU. Main owners grid has caused the VW-group big financial burdons due to US compensation. In EU and the rest of the world not yet compensated and there are still costs for nations, retailers and customers. When EU and German government tries to save the responsible main owners, Global Scientific Authority do not. The responsible main owners can and should first of all put in all their together about 34 billion Euros for compensation. EU and Global Scientific Authoritiy intentions about what to do, who there are to blame, who interests thera are to protected and compensated are total opposite. Global Scientific Authority will without any doubt be by public opinion supported by more the 99 percent of EU-citizens. Hard for EU and German government to motivate their mandate to support and back up Porsche-Piëch family interests and Qatar Holding. The transportminister in the German government, Mr Andreas Scheuer, has announced that he will take some help from EU-colleagues to get released of the negative effects of dieselgate. He should instead use his energy to make Mr Winterkorn and other VW-staff to tell the truth about the main owners, Qatar Holding and Porsche-Piëch family, orders. As long Germany is not capable to present the true story there will be no reason for the rest of Europe to be helpful. The Europeans has still about 400 billion euro in claims on VW-company if they had been compensated as US was. A hard task for Mr Scheuer to convince the rest of Europe to drop the claims in a mission to save Qatar-Holding and the Porsche-Piëch families. Germany and it´s government has to deliver. For Global Scientific Authority brand it is important to keep up the ethical standard as a gurantee for human values. Dieselgate has not yet reached the responsible owners that also have political burdons. Qatar holding as a political and financial supporter of terrorism in the Middle-East and the Porsche-Piëch families ownership based on nazi warcrimes. Especially of Global Scientific Authority interests to show the world that former generations crimes will not give the descendants a favour financial and political position. EU and Germany have tried to protect the VW Group main owners by doing nothing when it for everyone familier to German traditions it it obvious that everything was well sanctioned among the VW-board members. Board members with very close relations and orders from the main owners. EU and Germany has to make Mr Winterkorn and the VW-staff involved to tell the truth if they have ambitions to qualify as representative for ethical standards set by Global Scientific Authority as a guarantee for human values. Qatar is as a member in OPEC seen as persona non grata. Qatar financing of terrorism in the rest of the Middle-East has by Global Scientific Authority set focus on where such nondemocratic interests invests. Many thousend german workers, Bundesland Niedersachsen and million buyers lojal with the VW-brand are by Qatars engagement in terrorism also involved in financial support of terrorism in the Middle-East. OPEC as an organisation, with a lot of finacial interests in westworld companies, can not be a partner with Qatar in OPEC without acting as an interests for terrorism. That will also risk all the OPEC-countries investments in west-world companies similar as VW suffers and will suffer much more due to Qatar ownership. An ownership that also systematic has fooled a whole world about their exhaust levels. We are still waiting on the true story from Mr Winterkorn and others that makes it possible to release democratic Bundesland Niedersachsen and democratic Germany from responsibility and guilt. Below told that the representative for Bundesland Niedersachsen in the VW-board was not representative for them they had to represent. That is total essential if Niedersachsen, VW-employed and Germany will be withdrawn responsibility for dieselgate. When EU now tells that they will continue to political and financial support Iran and it´s nondemocratic and aggressive government they also are allied with the interests and boardmember of Qatar Holding and their financed terrorism in the Middle-East. The democratic elected EU-representatives are representing a political strategy that makes it impossible for Niedersachsen and Germany to be held without responsibility. EU leadership is dragging democratic Niedersachsen as equal responsible for dieselgate, claims about 400 billion euro, as representatives for nondemocratic interests. Angela Merkel and the German government has understod the message. Three main owners are responsible for VW-dieselgate. The nazisupporting Porsche-Piëch families, a non-democratic interest Qatar holding and the democratic Bundesland Niedersachsen. As long as Germany and EU tries to protect all the owners responsible for the dieselgate, also Bundesland Niedersachsen will be punished. When Angela Merkel stops German weapon-export for 416 million euro to Saudi-Arabia it is a very significant political step in protection and in advantage for democracy. Angela Merkel and Germany are now enjoying to Global Scientific Authority and humanity interests. The political possibility to punish the democratic Niedersachsen, Germany and it´s population is by Merkels political statement for democracy, withdrawn. When the democratic Niedersachsen boardmembers do not represent their Bundesland and German interests, their populations and VW-workers can´t be set responsibile for dieselgate. For Niedersachsen and German interests Mr Winterkorn and other with knowledge now have to tell the truth. The Porsche-Piëch family and the non-democratic Qatar holding interests are a political burdons. German government and Angela Merkel has left them behind as they not longer are an interest for Niedersachsen and Germany. There is now split between German interest and non-democratic ownership in VW-company. There is also a split between German interests and the EU-support of non-democratic governments and other non-democratic interests in the Middle-East. The german government has decided that the car-companies has to take the diesel-gate costs. The car-workers and shareholder most far away from the company boards and also big taxlosses for the german population will be those who have to pay the costs for boardmembers try to fool us all. Boardmembers that has it´s origin in nazi warcrimes and boardmember Qatar holding that uses the revenue from VW to finance terrorism in the Middle-East. Instead of chasing the main VW-owners, that have tried to fooled us all, the german government protects them and lets the ordininary people take the costs. German political and economical establishment cooperation is stripped. It will make the german population furious when it become obvoius that Global Scientific Authority do set the main big VW-owners responsible to pay a similar compensation at a same level as US already have got. Global Scientific Authority stretegy is to protect the VW-company and national german interests.The german government choses instead to represent the main VW-owners interest with heavy political burdons on the costs of german car-industry and german population. Down below is descriebed the relations between the interests involved in VW-dieselgate as an explanition why EU-establishment lets VW-group slip away from compensation. A compensation that already has a decieded level in USA. A very simple task for EU to set a similar compensation for EU-countries, retailers and VW-buyers as USA has become. The reason is that USA just have about 1/20 of the number sold faked environmental polluting cars compared with EU. The compensation would be almost 400 billion Euro and VW, worlds biggest carproducer would go broke. EU-politicians have decieded to withdraw compensations and let the EU-countries, retailers and VW-buyers take the losses. That are fake concerns. It is an EU and national interests to preserve the VW-group and the group should not take the costs for what is decieded by the VW-group board. A board dominated by a few main owners. The EU-politicians and EU-establishment do not protect the VW-group. They are representing the interests of the main big owners that have decided to fool the whole world by producing fake technical data. When EU-establishment just let 400 billion EURO slip away it is not in the interest of EU-citizens or the VW-group. It is to protect the Porsche-Piëch and Qatar holding economical interests on behalf of the EU-citizens interests. It is just a matter of time before Martin Winterkorn and others involved understands that the very best thing to do is to lift of the compensation claims from the VW-group and hand them over to Porsche-Piëch and Qatar holding. It is easy done just by telling the truth. VW har nu sparkat chefsingenjörer som ansvariga för avgasskandalen. Med den åtgärden försöker man hitta och skapa syndbockar så att man kan bespara koncernen worldwide skadeståndskrav på över 5 000 miljarder SEK. Något som blir utfallet om ägarna själva kan styrkas som ansvariga. Det finns således obegränsad finansiell höjd för att få ett gäng chefsingenjörer att ta på sig ansvar och skuld för något som är väl förankrat i högsta ledningen och hos ägarna. Det finns inga tyska chefer som på egen hand skulle ta ett avgasbluffande initiativ.Tvärtom har ledningen sannolikt mött en hel del motstånd från dem på vägen. Även om de frikostigt köpts ut så utgör de en potentiell fara. För sanningen kan man erbjuda bättre villkor än de villkor de har fått för att ta på sig skulden och hålla tyst. Vi får se om även EU:s politiker låter sig köpas av bluffen med konsekvensen att medborgarna får avstå 4000 miljarder för att skydda VW och dess ägare. Med den fullständigt okritiserade insteget i de västerländsk industri och fastigheter från odemokratiska regimers helkontrollerade företag har med exemplet VW gett investerare en väckarklocka. Speciellt har detta fått genomslag i Australien. Där har insikten om att ett företag som ägs av odemokratiska intressen som genom ägandet skapar sig geopolitisk makt knappast är ägare och företag som tilltalar företagets kunder. Att helt okritiskt sälja till odemokratiska intressen går utmärkt så länge som detta förblir allmänheten obekant. När det odemokratiska ägandet och dess ambitioner blir kända för allmänheten kommer kunderna att överge dem och börsvärdena att kollapsa. Tyska myndigheter har förstått och lagstiftar. Investerare i Australien har redan börjat agera och sälja av. Merpareten av västvärldens regeringar och ledare förhåller sig passiva och kommer att påtala faran såväl för odemokratiskt inflytande som värdefall först när marknaden redan löst problemet. Tyskarna har nu förstått att ägande företrätt av icke demokratiska intressen och till terrorismfinansiering hotar att skada tyska företags varumärken och kraftigt skada tysk ekonomi. Dagens beslut av den tyska regeringen att sänka utländskt ägande från icke EU-länder till maximalt 15 procent påverkar direkt VW-koncernen och Qatar-regimens innehav. Ett tydligt besked till Qatar och andra att det inte är acceptabelt att överföra vinster från Tyskland till att finansiera terrorism och stötta ickedemokratiska regimer. Vi kan förvänta oss att alla andra EU-länder snart börjar ansluta till Tysklands linje. Svensk bilindustris relation till Kina blir en angenäm uppgift att hantera. I USA omfattas dieselgate av ca 475 000 bilar. För detta har VW fått betala ca 25 miljarder USD sammanlagt till lurade kunder, återförsäljare och staten. I Sverige omfattar dieselgate 225 000 bilar, Europa ca 8,5 miljoner och worldwide ca 11 miljoner. Det är såväl en enkel matematik som juridiskt självklart att hävda att alla skall kompenseras lika. För svensk del motsvarande 11,8 miljarder USD eller ca 105 miljarder SEK. Totalt Europa 3970 miljarder SEK och totalt worldwide ca 5140 miljarder SEK. I USA omfattar kompensationen ca 470 000 sek per bil där merparten gått till konsumenterna för återköp. I Sverige och Europa får konsumenterna själva ta hela värdeförlusten. Det enda som erbjudits är en uppdatering av den manipulerade programvaran som dessutom innebär att fordonen tappar effekt. Ytterligare en värdeförlust som av våra politiker späds på när dieselbilar förbjuds på vissa gator och stadskärnor. EU:s politiker skyddar VW och dess ägarna på de enskildas bekostnad. Fuskets syfte var att tjäna pengar på att lura alla att VW sålde miljövänliga bilar som i verkligheten var värsta miljösvinen. Med Europas etablissemangs fulla stöd har fusket hittills för VW varit en ren guldgruvan. Med relativt smärre avdrifter till USA, med drygt 4 procent av bilarna, så är USA:s konsumenter den enda som kompenserats. 96 procent av VW:s drabbade kunder blir först systematiskt grundligt lurade. När fusket upptäcks får de ändock stå för hela skadan. Etablissemanget väljer att skydda Porschefamiljen och emiren av Qatars förmögenheter på medborgarnas bekostnad. Fusket var och är för ägarna, trots kompensationen till USA, sammanlagt en mycket lönsam affär. Incitamentet att fuska har av europas etablissemang fått full uppbackning när de tror att skadan kan fördelas på den lurade allmänheten. Övervinsterna till finansiering av terrorism. Qatar Holding äger 17 % av VW-koncernen och 15,6 % av röststyrkan. Qatar Holding kontrolleras av kungafamiljen och Qatars förmögenhet betraktas allmänt som synonym med emirens,Tamim bin Hamad Al Thani:s, egen ficka. Släktingen Abdullah bin Mohammed bin Saud Al Thani är Qatar Holdings representant i VW:s styrelse. Qatar är av de arabiska länderna Egypten, Bahrain, Saudi-Arabien och Förenade Arabemiraten helt politiskt och ekonomiskt isolerade med anledning av att de finansierar terrorism. En uppfattning som delas av USA och som Trump i juni 2017 uttryckte det. Qatar är sedan många år tillbaka, en av världens största finansiärer av terrorism. Qatar finansierar, med Turkiskt politiskt stöd, det Muslimska brödraskapet. Ryssland, Syrien, Egypten, Saudiarabien och Förenade Arabemiraten betecknar officiellt Muslimska brödraskapet som en terroristorganisation. Rörelsen har som grundval att driva kampen mot Israel och sionismen. Hamas var enligt första utgåvan av sina stadgar den palestinska grenen av brödraskapet. Det Europeiska etablissemanget skyddar fusket som gett Qatar Holdings övervinster. Vinster som emiren använder till att finansiera terrorism och kampen att utplåna Israel. VW:s medarbetare, dess kunder, samt nationerna och den breda allmänheten som miljömässigt drabbas, får för nämnda ändamål, på grund av det Europeiska etablissemangets välsignelse av fusket, avstå 4000 miljarder i kompensation. Förmögenhetsbygge på nazismen och Hitlers brott. VW-verken är ett från nazismens och Hitlers brott ett historiskt mycket välmående arv. Ferdinand Porsche har gått till historien som mannen bakom världens mest tillverkade bil, Volkswagens "Bubbla". Den var till huvudsak en kopia av Tatra 97. Tatra 97 var en tjeckis bil, konstruerad av Hans Ledwinka och en tidigare chef över Ferdinand Porsche. Hitlers omdöme om Tatra 97 var att detta var bilen för tyska vägar. Ferdinad Porsche fick uppdraget att ta fram en tysk bil och när VW 1, den första "bubblan" presenterades, så blev de omedelbart stämda av Tatra för patentintrång. Porsche medgav att Tatra 97 varit hans förebild men Hitler motsatte sig stämningen. Tvisten löstes på Hitlers sätt när Tjeckoslovakien ockuperades och all produktion av Tatra 97 förbjöds. 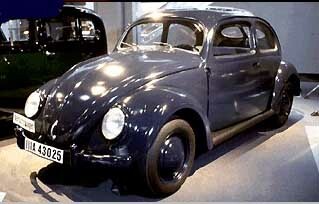 26:e maj 1938 lade Hitler första grundstenen för Volkswagenwerke. Adolf Rosenberger var en frmgångsrik racerförer för Mercedez och Bentz under 1920-talet. Han var medgrundare till Porsche konstruktionsbyro tillsammans med Ferdinand Porsche och Anton Piëch. Rosenberger förmodas inledningsvis ha hållit firman finansiellt under armarna då firmans brist på uppdrag och trots Porsches oförmåga att göra bra konstruktioner ändock överlevde. 30 juli 1935 sålde Rosenberger sin andel av företaget billigt till Ferry Porsche och i September samma år arresterades han för "rassenschande" , rasskändning. Efter tre veckor släpptes han och han lyckades så småningom ta sig till USA. Efter kriget krävde Rosenberger 200 000 Mark ytterligare i ersättning mot bakgrund av att hans judiska påbrå utnyttjats vid hans utlösen ur firman. De enades om 50 000 Mark och en bil. Från 1941 blev Ferdinand Porsches svärson, nazisten Anton Piëch, fabrikschef. Båda medlemmar i NSPAD och även SS. Under kriget byggdes fordon för militära ändamål och även Vergeltungswaffe, V1-raketerna. Arbetskraften var under kriget krigsfångar och koncentrationslägerfångar. Anton Piëch lät grunda ett barnhem för att nyblivna mödrar och deras barn. Minst 350 spädbarn anses där ha mist sina liv och mödrarna redan efter ett par veckor från börden åter i arbete. Den 10:e april 1945 tog Anton Piëch 10 millioner riksmark med sig som sedan användes i Porsche KG, föregångaren till Porsche AG. Till Porsche AG betalade Volkswagenverken 1 % i licensavgift på priset för Volkswagens standardbil. Patentintrånget på Tatra T 97 fick dock betalas av Volkswagenverken AG 1961 med 1 miljon D-mark. Porsche Holding kontrolleras av familjerna Porsche och Piëch, med såväl en konstruktion som grundkapital en gång stulet. Möjligheten att stjäla gavs under nazisternas och Hitlers försorg, tillskapat från arbetsinsatser av ca 20 000 tvångsarbetande krigs- och KZ-fångar. Ferdinand Porsche anlitades även som konstruktör åt krigsindustrin utan framgång. Hans stora förmåga baserades inte på eget arbete utan att som nära förtrogen med det nazistiska partiet kunna tillgodogöra sig andras förmågor. Svärsonen Anton Piëch gick redan 1933 med i det då, förbjudna Österikiska Nazistpartiet. 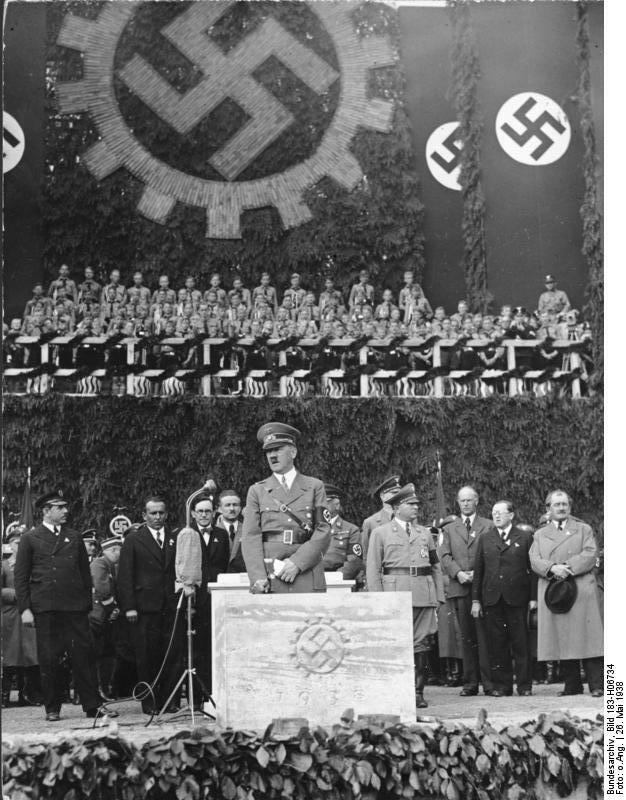 I Juli 1937, 9 månader före Österrikes tvångsanslutning till Tyskland, gick han med i det tyska, NSPAD och så sent som 1944 även medlem i SS. Hans son, Ferdinand Piëch, var fram till 2015 och dieselskandalen, ordförande i Volkswagens överstyrelse. 2008 genomdrev Ferdinand Piëch för Volkswagens AG:s räkning köpet av Investor aktier i Scania. Som huvudägare i tre lastbilstillverkare, Volkswagens, MAN och Scanias med syftet att slå ihop dessa. EU hade dessförinnan förvägrat Scania och Volvo att slå sig samman i en svensk dito. Scania har nu införlivats i den historiskt belastade nazistiska familjen. Det nazistiska arvet, muslimsk terrorism och europeiskt etablissemang samarbetar åter i judiskt hat. Volkswagens historia, mycket intimt förenad med Porschefamiljens Nazistiska sympatier och de fördelar detta gav, långt bortom lag och moral, har gett familjen Porsche en affärsmässig hävstång som nu, fortsatt med fullt politiskt Tyskt och EU-stöd, vuxit till världen största och ledande bilproducent. Att detta historiska arv finner samhörighet med Qatar Holding och deras stöd av Muslimska brödraskapets med mål att utplåna den Israeliska staten är ingen slump. Den moraliska kompassen har aldrig funnits hos familjen Porsche-Piëch och kommer inte heller någonsin att finnas. Att Qatars kungafamilj och emiren Tamim bin Hamad Al Thani helt saknar moralisk kompass läggs dagligen bevis för. Han finner bäst samhörighet hos Erdogan i stödet av Muslimska brödraskapet. Att ett från ägarnivå moraliskt helt förtappat företag skulle försöka lura sina kunder, medarbetare, återförsäljare och all världens medborgare är knappast någon överraskning. Däremot kan man ju undra hur Europas politiska och ekonomiska elit tänker när de på alla sätt försöker vara VW och dess ägare behjälplig. De låter alla europeiska kunder, medarbetare, återförsäljare och medborgare luras på 4000 miljarder SEK och föredrar att finansiera hatet mot Israel och judarna. Berätta sanningen eller låt VW gå under. Den som på något sätt har erfarenhet av Tysk företagskultur förstår att de chefer, Rupert Stadler, Martin Winterkorn m.fl, som nu granskas för sin medverkan i dieselgate, håller ägarna om ryggen. Ingen tysk chef skulle utan full förankring hos huvudägarna och på eget initiativ driva igenom ett dieselfusk. Om så hade skett skulle styrelsen dessutom själv vara de mest angelägna att hitta och straffa de skyldiga och ansvariga cheferna. Problemet är inte att vi inte vet och vi inte förstår utan att det av EU politiker och övrigt etablissemang som ger fuskarna fullt beskydd och stöd. EU-etablissemanget har hittills valt strategin att blåsa EU:s medborgare på nästan 4000 miljarder kronor för att skydda familjen Porsche-Piëch och emiren av Qatars förmögenheter. Bara Global Scientific Authority anser att de skyldiga skall betala. Det förefaller för gemene man uppenbart att den som är skyldig till skadan skall betala. Europas politiker och ekonomiska intressen lägger däremot skadan på de lurade och förledda. Den som väljer att företrädar allmänhetens intressen har till förfogande 4 000 miljarder mer än de politiker som företräder familjerna Porsche-Piëch och emiren av Qatar. Skadan skall i första hand bekostas av de skyldiga huvudägarna och i andra hand av Volkswagen AG. Att fuska skall inte vara lönsamt. En åsikt som inom Europa än så länge enbart företräds av Global Scientfic Athority och Atlantispartiet. Opinionsläget synes således oerhört gott och vi ser med förtröstan fram emot att möta alla andra Europeiska politiska intressens stöd av nazism, terrorism och europeiska traditionell antisemitism. Separat för Sverige, 105 miljarder extra, för valet att skydda fuskarna istället för att företräda de lurade.